The purpose of this set was to challenge our athletes from a technical standpoint in all strokes. For the first 75, they swam with a tennis ball in each hand. As we have posted in the past, this essentially removes the hand as a propulsive surface, encouraging use of the forearms, the kick, and the core for propulsion. Setting the tennis balls down, we sprinted the first 25 (on a tight interval), paying attention to our cycle count and enjoying the sensation of having use of the hands again. 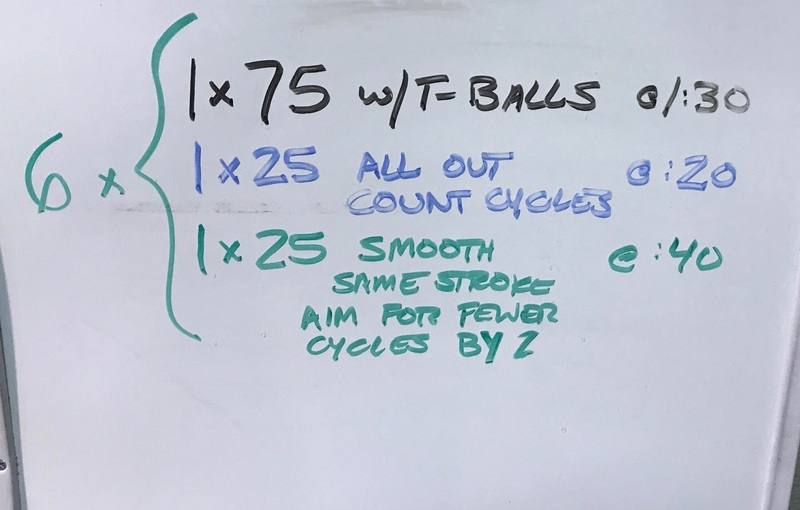 We followed that up very quickly with a 25 of the same stroke, demanding excellent efficiency and stroke length by asking for the 25 to be performed with 2 fewer cycles than the previous 25.